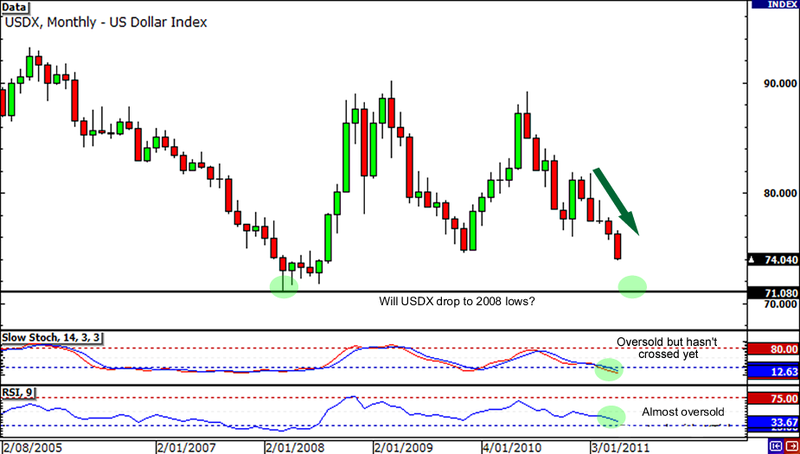 If you’re like Pipcrawler who likes to spend gazillion of hours looking at different charts, then you’ll probably notice that the dollar index is fast approaching the 2008 low at 71.080. I know that the index has already broken more than a few psychological levels in the past, but this time around the Greenback has oscillators on its side. Taking a peek at the monthly chart, you can see that the RSI is heading towards oversold conditions. Also, we can see that even Stochastic is hanging around in the oversold region. Stochastic hasn’t crossed over yet, but you can bet that many traders are getting ready to pounce once it does! Another contrarian view would be to take a look at the Commitment of Traders report. If you’ve gone through the School of Pipsology, then you’d know that the COT trading strategy revolves around picking sentiment extremes in futures contracts and trying to pick tops and bottoms. In late 2009 speculators were long 51,045 contracts, with 71.01% of total speculative contracts (that’s long + short contracts) being long. Soon after that extreme, EUR/USD topped out at 1.5100 and shot all the way down to 1.2000 over the next few months. In comparison, as of last week (April 19, 2011), speculators are net long 62,195 contracts for EUR futures, with 71.72% of total contracts being of the long variety. So not only are speculators taking on more long-contract, but the %-long ratios are very high and very close. As we’ve pointed out in our COT lesson, if everyone is long, then that means there is nobody left to buy, indicating that a reversal may be coming soon. Remember, EUR/USD is the most traded currency pair. In addition, some consider the euro as the “anti-dollar”. 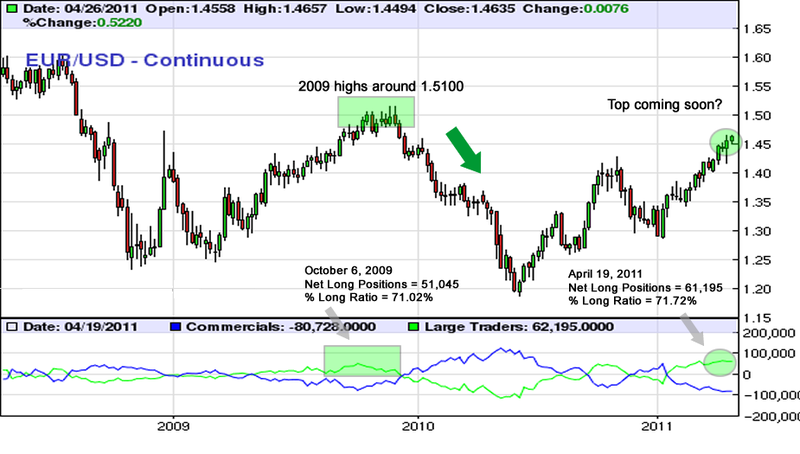 It’s no surprise that when EUR/USD topped out in late 2009, the dollar index also made a similar reversal. Any strong moves in this pair could have a big influence on overall dollar trading, so make sure you keep an eye out on EUR futures contracts. Despite the strong performance of the euro on the charts, traders haven’t forgotten that economic growth in the Euro region (especially the PIIGS) is still on the rocks. In fact, wasn’t it just yesterday when an ECB member said that a Greece restructuring would be worse than the Lehman Brothers collapse? Heck, even Portugal is hanging by its fingertips as news of its trouble with its debt-to-GDP target got around. Over in Asia, Japan and China are also posing threats to global growth. With the two being amongst the top three global economic giants, any trouble in their economies could hurt their trading counterparts (basically all the other economies). Remember that the Japanese officials have been whispering that the Japanese economy might get back into recession due to last month’s earthquake and tsunami. As for China, who could forget that it’s struggles in chasing inflation? The PBoC has been increasing its RRR and interest rates left and right for the past couple of months, all in an effort to stem off the effects of rising inflation. The side effect of this though, is that it may choke off Chinese demand. As awesome as my reasons are though, you have to remember that these are all just contrarian views to what the market is doing, which is selling the dollar. If you think that the dollar’s struggles are about to come to an end, you may want to consider establishing a long position in the dollar soon. It may be difficult to go against what everyone else is saying and doing, but if you just happen to catch the bottom, you could get in a trend earlier!